It’s estimated that the total cost of drug abuse in the United States is more than $820 billion per year. Furthermore, drug overdoses take the lives of about 72,000 people each year. Yes, there’s an ongoing crisis in the United States, and much of this has recently been driven by increased opioid abuse. The National Institute on Drug Abuse states that opioid overdoses kill about 115 people daily, and the American Public Health Association claims that the opioid crisis alone is about an $80 billion burden on the economy. There’s more to law enforcement than just apprehending drug suppliers. With new fentanyl-containing drugs regularly appearing, officers need to have a safe, viable means of testing unknown substances. Such instruments don’t just validate drugs, but they can also help keep officers safe from prolonged exposure to them. High-tech handheld instruments are being increasingly utilized to safely and conclusively test unknown substances that officers confiscate on suspected drug raids. These instruments are designed to deliver immediate results, which is a much faster validation method than the several weeks a testing lab can take. Fighting the opioid crisis isn’t just up to law enforcement, but to local governments, health care centers, first responders and more. That’s why many municipalities have joined the Opioid Mapping Initiative, which consists of shared data between the various city entities. When these entities can compile their resources, they can map out locations where opioid overdoses are occurring, share stories related to deaths and put more of a localized human touch on the national crisis to serve as a learning tool for community members. Mapping out this data can help show how widespread the crisis is and directly affected people on where to go to get help. It can also help police intensify their surveillance of high activity areas and assist emergency responders with routes to and from such areas to hospitals. Another powerful source of information in drug trade investigations is video data. 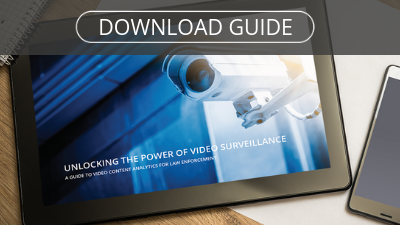 Law enforcement can leverage existing video surveillance infrastructure to collect and structure data, so it can be visualized and analyzed as evidence. The police in Hartford, CT, credit Video Content Analytics technology with helping them identify drug houses. Working off a tip about a street where drug deals were taking place, the police used video analytics to process surveillance footage, visualize the pedestrian traffic hotspots and common paths, and, in a matter of seconds, reveal the house where illegal drugs were being sold. VCA systems turn surveillance into fast, actionable intelligence, and they’re a far more efficient means of identifying and policing drug dealing than sifting through hours or days of recorded video, or sending officers undercover or on laborious stakeouts. Additionally, data analytics are being increasingly used to detect wrongdoing by prescription providers. This is part of the Opioid Fraud Detection Unit initiative, which was introduced by the federal government earlier this year. National efforts to curb drug abuse in the United States are ongoing and will take time to post significant results. But with innovative technological solutions, law enforcement is poised to evolve and respond to the crisis in new, more effective ways than before.